Greetings and thanks so much for visiting. I’m Linda Farmer, but you’ve deduced that by now. 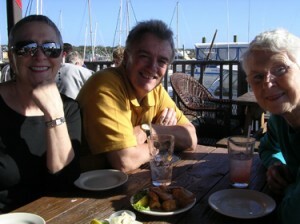 This picture of me with two of my favorite people on the planet (hubby and Mom) was taken by my lovely sister (another favorite people) Karen at Hurricane Patty’s in St. Augustine. This website helps satisfy my techy curiosity about how blogs and the web world in general work, but more importantly I fancy sharing good things I’ve learned about. So I guess you could say this is my playground. I was born in Ontario, Canada. I am firstborn of 4 women. My dear late father, Eric McComb, worked for Ontario Hydro and we moved all over the place. I went to a different school every year of K-to-12, including the American Community School (ACS) in Beirut, Lebanon for my sophomore year in high school. Then I earned a B.A. (mostly English Lit) from York University, in Toronto. My husband of 37 years and counting, Robert, and I have lived and worked in the United States since 1980. We first moved from Toronto to Pittsburgh, PA then on to Fort Lauderdale, FL. We’ve been Floridians since 1984, first 23 years in Fort Lauderdale, and the last four in St. Augustine. Hurricanes drove us north, but we are so glad we now live in St. Augustine. Not so crowded as South Florida. We’re big college football (Canes, FSU, Gators) and Miami Heat fans. Also love watching the golf majors. And definitely BIG fans of the Tour de France – how can you not like touring France for 3 weeks each year from the comfort of your sofa? We love to dine well at home and enjoy listening to our jazz collection when we aren’t being sports spectators. Robert and I have worked together in our marketing communications business, Concept Communiqués, Inc. since 1989 – celebrating 22 years this year!